David Wasserman (1917-1999) was a graphic designer and cartoonist who experimented in his spare time with metal collage. 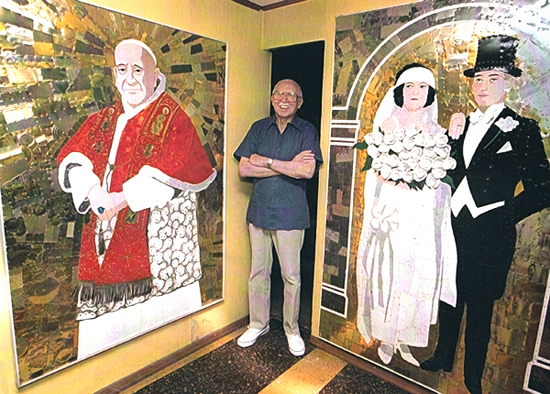 For more than thirty years, he created richly-detailed large-scale pictures by nailing small pieces of tin cans, aluminum soda cans and other metals to sheets of plywood. Since he wanted to explore all the artistic possibilities of the medium, the style of his work ranges from abstract to cartoon to realistic, and his subject matter includes famous people, powerful beasts, the depths of space, family photos, and an urban cityscape. "There is a beautiful honesty in the way David Wasserman uses metal. He has devised a remarkable partnership between the material and style of each image, and there is a purity in these artworks which I feel is due to the fact that he created them with no thought of sales or fame, but solely for the sake of making them as wonderful as he could." David Wasserman was both a graphic designer and a cartoonist. 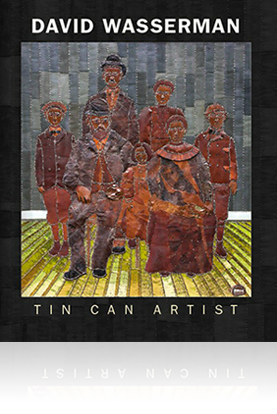 Fine art reproductions and other items based on his tin can art are available at our store. A full-color catalog of David Wasseman's works is now available at blurb.com.